Back in the day, when most of my riding was off-road, there were only few magazines to choose from. On the newsstand were Bicycling, Mountain Bike Action, Bike, Dirt Rag – all good but somewhat sport-cycling related. At the time I didn’t care, because that’s how I rolled. 15) Cranked – This was a publication that’s no longer in production. It had the potential to be an awesome magazine, but couldn’t keep the momentum going. 14) Riders’ Collective – This is a relatively new magazine and I don’t know much about it. That’s why it rolls in at 14. 13) Bike Hugger – This is actually a blog and not a true magazine – which is the only reason it’s not higher up on the list. They have a really strong online presence with content that’s very interesting. If they ever published a mag (online or print) I would subscribe. You’ll probably see a reference to these guys again when I list out my top bike blogs. 12) Velo Vision – “The Practical Cycling Magazine” – Nice mag from the UK which makes the list because of the nature of its content. I’ve only downloaded a sample issue with some interesting articles about some unique bikes. The art direction is good, but a bit flat. 11) five five nine – With only two issues (only one downloadable) under its belt, it’s hard to make a judgement on this. The content is mostly mountain bike, but the attitude and design are incredible and worth a taking a look. 10) dandyhorse – “Toronto on Two Wheels” – From what I’ve seen, nice design with good content. However, as you’ll see with some other well-produced magazines, it’s very expensive and not published very often. 9 ) COG – From what I’ve seen on their site, this is a nicely designed publication with some great content. These guys really love bikes. Unfortunately, the subscription is expensive and there isn’t a downloadable sample to make me want to invest in it for a year. Great products cost a lot of money to produce, making each issue expensive. Expensive issue subscriptions lower the readership. Lower readership reduces advertising income. Less advertising income can’t help offset the cost to produce a great product. This is the unfortunate cycle (pardon the pun) of magazine publication revenue that kills some great products out there. I hope it doesn’t happen to them. 8 ) The Ride Journal – This is an awesome magazine published out of the UK. The design and content are top notch. Unfortunately, as with the previous three pubs, it’s very expensive. The great thing is, if you’re willing to wait, you can download a previous issue. That alone, pushes it up higher on my list. Because of that, I’m temped to subscribe. 7 ) City Cycling – Nice online magazine from the UK with good content. However, being all built in html, the design is understandably a bit flat. They get a huge plus from me because the content is free. There’s a subscription link on their site, but it’s just an email address. 6 ) Practical Pedal – This is another great publication “for anyone who thinks bikes make great transportation”. Like many others, the design and content is really nice. You can view each issue for free on the digital magazine site called issuu. There’s an option to “subscribe to the print edition for any price you’d like”, but it isn’t clear on how to do that. 5 ) Kickstand – Nothing says casual riding better than a cruiser. This is a magazine about beach cruiser style bikes and the cruiser bike culture. Nice, but it’s a little too much of a niche for me. I enjoy reading it, but not enough to subscribe. 4 ) Momentum – “The Magazine For Self-Propelled People” – This is a really nice publication that’s free if you happen to have one of their Community Partners near you. If not, you can subscribe for a small fee. They also have a downloadable version as well – although the issuu viewer app is a bit quirky. I prefer a good ol’ fashioned, self-contained pdf. To be quite honest, I really haven’t given this publication a proper chance and it would probably move up the list if I did. 3 ) Bike Monkey – Although this is mostly a mountain bike magazine, I still enjoy it. It is probably one of the better designed publications with some of the most well written articles out there. I’ll read this magazine from cover to cover if I get time. They also have a good online presence that keeps me informed as well as a way to view old issues through issuu. The only drawback for me is that it isn’t geared for the type of riding that I currently enjoy. 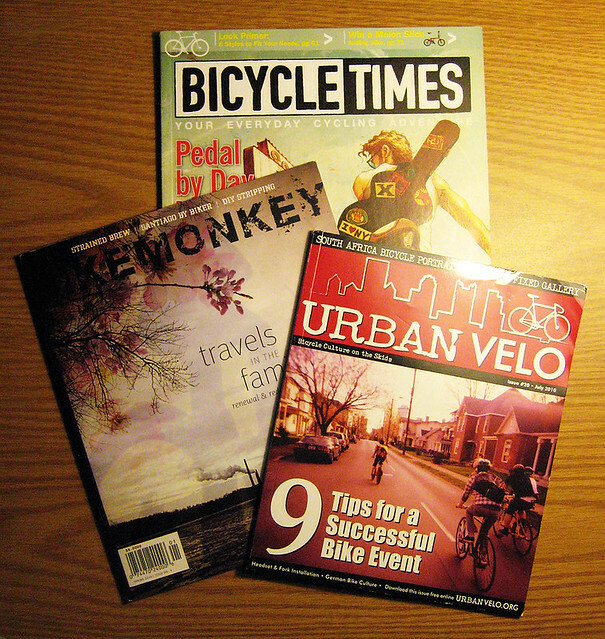 2 ) Urban Velo – “Bicycling Culture On The Skids” This came close to being number one for me. I’m a huge fan of the “I Love Riding In The City” series because it shares a wide variety rider perspectives from all over the world. The design of the magazine has a nice urban feel and it’s scaled smaller to fit nicely in my bag. Like with, Bike Monkey, I enjoy reading each issue from cover to cover. They have a great online presence with news updates that keep my RSS feed well stocked with good bike information. Plus, they offer up a FREE downloadable version of each issue as well. This is a publication done right. The only drawback for me is that it feels a bit too urban. Not that there’s anything wrong with that – but at my age, I fall a bit out of their demographic. 1 ) Bicycle Times – For “Your Everyday Cycling Adventure.” From the guys who publish Dirt Rag, this is a quarterly magazine that caters to everybody who doesn’t ride for sport. You get a quality product, backed by years of cycle publication experience – all with a fresh spin that I can relate to. The design might not be cutting-edge, but the content more than makes up for it. There are only a few drawbacks: I wish they would publish more issues per year, their online presence isn’t as strong as some of the others and I wouldn’t mind free downloadable issues to go along with my print subscription. That covers a few of my favorite bike magazines. If I missed any of your favorites, please post a link in the comments. I would love to check them out. Cyclecross isn’t something that I’ve gotten into, yet. I’d love to watch a few races, though. Great list, one I would add is Bicycle Quarterly which is dedicated to vintage and classic bikes. I subscribe to several bike magazines and it’s the only one that I will not recycle or give away after I’ve read the latest issue. Every issue is a keeper. And as much as I like Urban Velo the “what city is your favorite place to ride” profiles begin to seem redundant after a while. I wish they would ask “what is your favorite bike and why” or something more revealing. Anyhow, great article and let’s hope the new kid on the block, Bicyle Times, is a huge success! Hoo! Thanks for the list! I’ve been desperately wanting to read something about bikes besides the “Here’s what to eat when you’re training.” I like burgers and coke, that’ll do! I’m going to go out and see if I can’t find some of these.